Yes it’s black history month, but family researchers with slave ancestors or those descendant of slave masters must tap slave and free-colored records year round. Why? Because these collections hold our history; a great part of the US history. So, here’s the highlight on slave and free-colored research using the U.S. Congressional Serial Set. The U.S. Congressional Serial Set, filled with genealogical tips, hints, and treasures, is not getting its fair share of attention by genealogists or other historical researchers. I can’t think of one reason why this free-resource is not being perused on a regular basis. It’s full of what we love – gossip, scandal, court cases and names of both supportive and vile neighbors. It covers topics on women, African Americans, Native Americans, students, soldiers, sailors, pensioners, landowners, and inventors. Is this not the genealogists’ dream? And as already mentioned – it’s free (with a library card). If you use the keyword “slaves” there are 659 occurrences Some of these documents give us social history and legal proceedings void of ancestors’ names and may be deemed less than helpful to the researcher. But, the collection also includes claims for slaves killed in the military – especially useful if you are stuck in the War of 1812 era, pension appeals, land disputes, and even emancipation information like that of Jane Hall (above). Emancipation Papers: Francis Hall and Others. Maryland slave Jane Hall, born 1799 ran away from her master in 1820 and subsequently was manumitted (as were her heirs) by Alexander Claxton in 1821. (Francis Hall, 55th Congress, 1st Session, Senate, Rpt No. 123). Many pensions were settled at the congressional level and the US Serial Set has detailed accounts of the requests, proposals and appeals. Richard Jackson, a slave and teamster for the Union Army was shot, captured and imprisoned, attempted an escape, shot again. The account is pretty detailed, and it also gives his slave master’s name as Dr. Charles J. Manning. (Serial Set-ID:2815 House of Representatives, Report No 2784, 51st Congress, 1st Session). 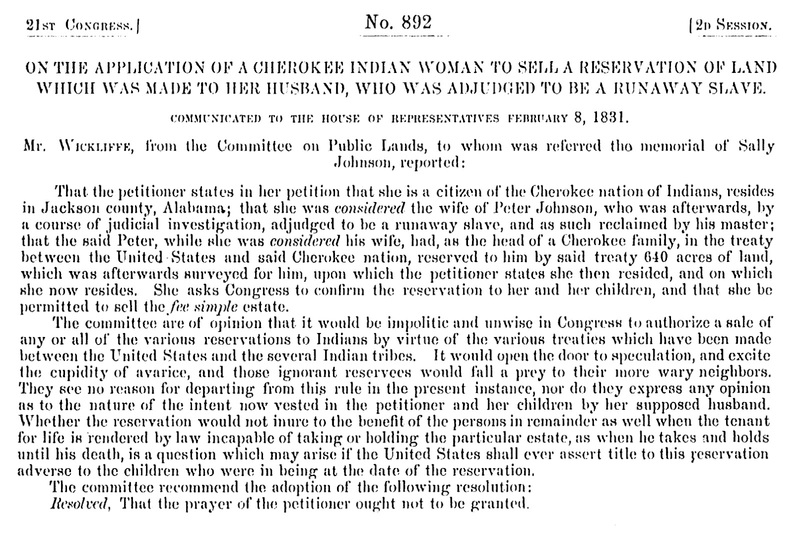 Land: On the Application of a Cherokee Indian Woman to Sell a Reservation of Land Which Was Made to Her Husband, Who was Adjudged to be a Runaway Slave. A difficult research project is the intermarrying of Native Americans and African Americans residing in the southeast. 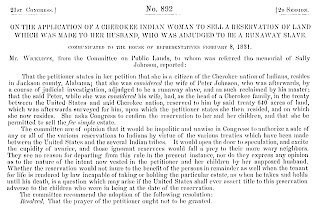 A report dated 8 Feb 1831 documents Sally Johnson, a citizen of the Cherokee Nation in Jackson County, Alabama married a runaway slave Peter Johnson. Peter was “reclaimed by his master.” The legality of selling of Peter’s 650 acres of reservation land was in question. (Serial Set: A3P033 Publ. land No. 892, 21st Congress, 2nd Session). 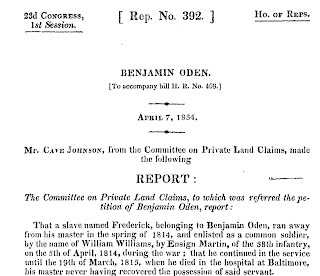 Runaway Slave Names: Benjamin Oden; 7 April 1834. Slave Frederick ran away from his master, Benjamin Oden in Maryland,1814. He enlisted in the military as alias William Williams and died in 1815. Military men were entitled to bounty land and the master wanted to claim the bounty land that would have been given to William Williams, as if he were a free man. This one report gave us the name of slave, freeman alias and master. 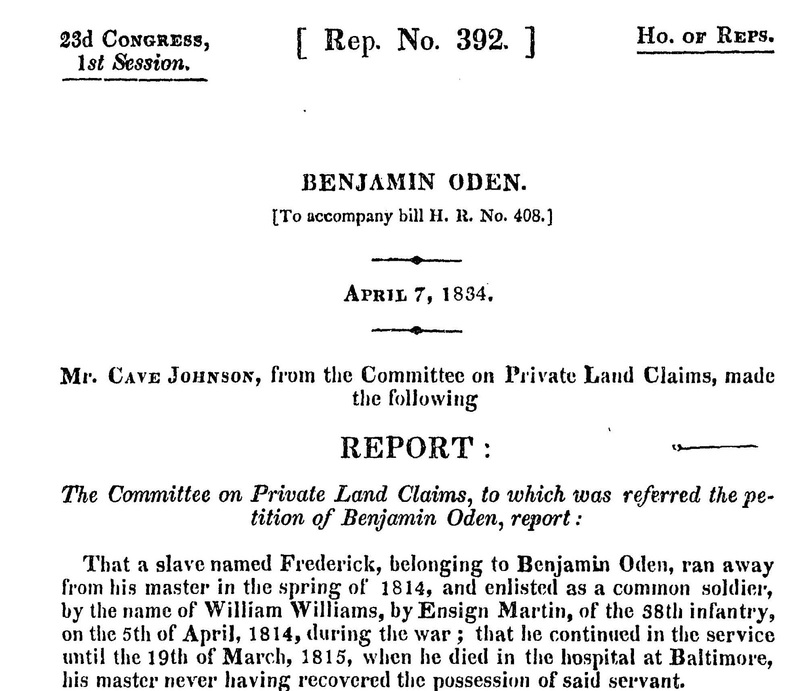 (Serial Set-ID 262; Benjamin Oden, Rep No 392, 23rd Congress, 1st Session, House of Representative). If you aren’t familiar with the Serial Set, be sure to read U.S. Congressional Serial Set for Genealogists, Part I. The Serial Set is an online resource available via your local library that subscribes to HeritageQuest Online; and, it’s accessible remotely using your home computer with a library card. I never heard of this resource before. Thank you so much, Karen for sharing it! This is wonderful! Immediately I made a note of this link. I never knew you could search it by word . . . maybe even by surname. I would not be at all surprised if some of my ancestors, and/or their slaves, are in this record. I'm not surprised that you are the one telling us about it, because you are the expert at finding little-known but very useful records. I'm going to click on "older post" now, to see what I have missed! As I've said many times, Kathleen you ROCK! You are right, The U.S. Congressional Serial Set, is definitely not getting its fair share of attention by me because I never thought gossip, scandal, court cases and all the other juicy tidbits you've mentioned in this post would be so well documented in this collection. And as Mariann stated, I never thought a surname search would yield any strong leads or information about my Texas ancestors. Well my library card and I are on our way over to HPL Library online to access this collection we find something good. Thank you so much for this information and lesson!